Two teams lacking in talents, one relying on defensive organisation and the other liking to counter-attack. If there was ever a game to ruin the first round of this World Cup’s spotless record of entertaining football, this was it. Yet, initially, it was the opposite. 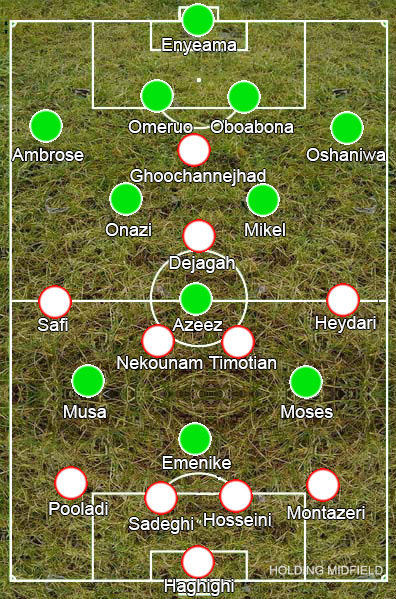 Nigeria went out in their expected 4-2-1-3, with Ramon Azeez ahead of John Obi Mikel and Ogenyi Onazi in midfield, while Carlos Queiroz set up his Iran side in a 4-4-1-1 with Fulham’s Ashkan Dejagah behind Reza Ghoochannejhad in attack. Iran were surprisingly proactive in an open start to the game, pressing intensely high up the pitch and breaking quickly with little passing triangles when they won the ball back. For whatever reason – whether they were worried about fitness, a half-chance for Nigeria unsettled them or Queiroz was worried that his side would not survive if they remained open – they stopped pressing and settled back into defending deep in their own half, with the game becoming about how Nigeria planned to break down their well-organised defence. Now whenever they won back possession they would still look to break quickly, but through poor long balls rather than the simple passing they had impressed with early on. Even without pressure, Nigeria looked lost on how they were meant to attack Iran. Victor Moses and Ahmed Musa came into the middle, meaning Mikel had to resort to short sideways passing rather than diagonal balls towards them, while Azeez was completely incapable of linking play through the middle. The introduction of Shola Amoebi meant Emmanuel Emenike moved to the flanks and he looked one of the brighter sparks, coming deep to collect the ball in space so he could turn and run at players, but Nigeria looked devoid of any real ideas. It was a shame Iran gave up their early strategy because it was making for an entertaining match and the more cautious approach essentially meant giving up on their best chance at a win in the group. It must worry Nigeria that they have dropped points against the group’s easiest side, even if their tactics are better-suited to playing the other two teams.